I imported the spreadsheet into SAS using Proc Import (dbms=xlsx), and used Proc Print to create my own table. Rather than trying to show all the values, I picked the ones I felt were most interesting. 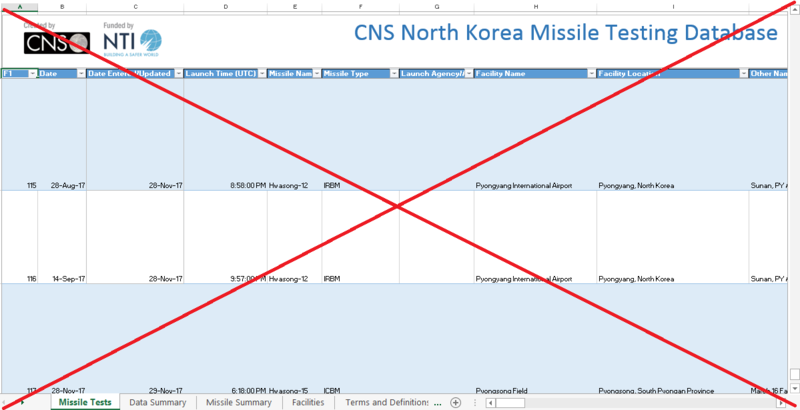 I also color-coded the Test Outcome, used a more 'friendly' date format (adding the day of week), and I made the Facility Name a link to the Google satellite map of that launch facility. Here's a portion of my table, showing the most recent launches (click the screen-capture below to see the full table). The NTI website provides several graphs of the data - one of them is a bar chart. 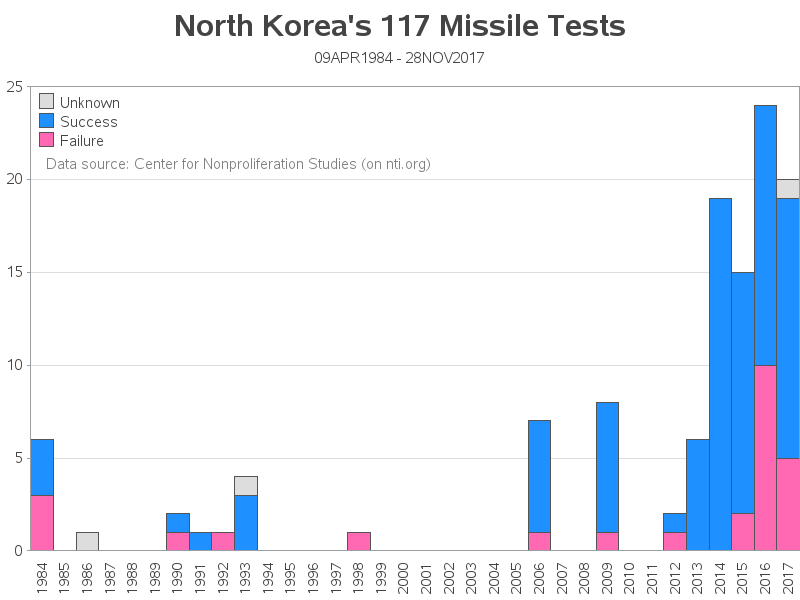 It shows that the number of missile tests has increased in recent years, and colors the bar segments by the type of missile. But there are so many different types of missiles, that the color-coding isn't very useful. Also, there's not enough room to fit all the year labels on the bottom axis, which makes it a bit confusing (for example some spots with no bars have a year label, and some spots with a bar don't have a year label). In my version I color the bar segments by the outcome (success/failure), and I show a year label for every bar. 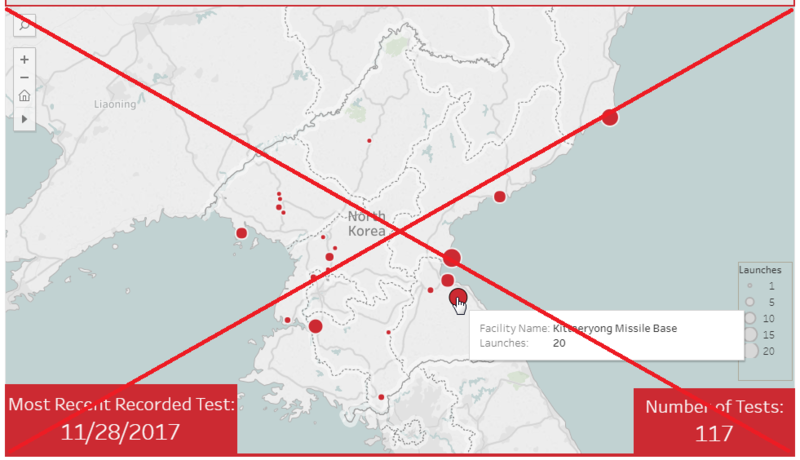 I also add a title showing the total number of missile tests, and the date range covered by the tests. I think my version is much easier to read, and get a good general sense of the data. And now for the grand finale ... the map! In case you didn't know, maps is kinda my thing! 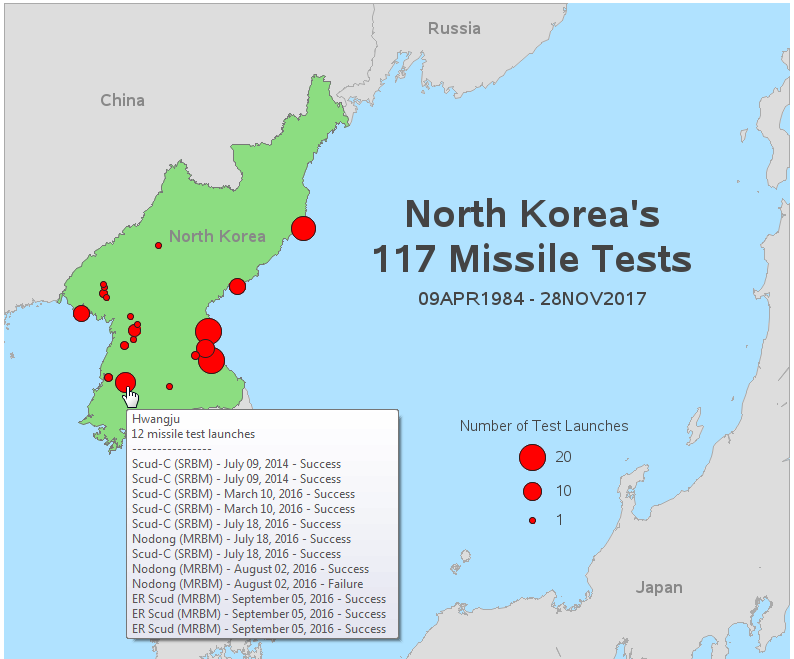 Their web page has a map, showing a red bubble at each launch location, with the size of the bubble representing the number of test launches from that location, and mouse-over text showing the total number of launches from each location. I approve of their approach in general (a simple map, showing the main information), but the technology they used to implement the map ruined the 'simplicity' factor for me. When I created my map, I made several improvements ... First, I used a static map, so you don't have to worry about accidentally panning or zooming it. My map also comes up much quicker in the browser, since it's only displaying a simple png image (rather than rendering map polygons). 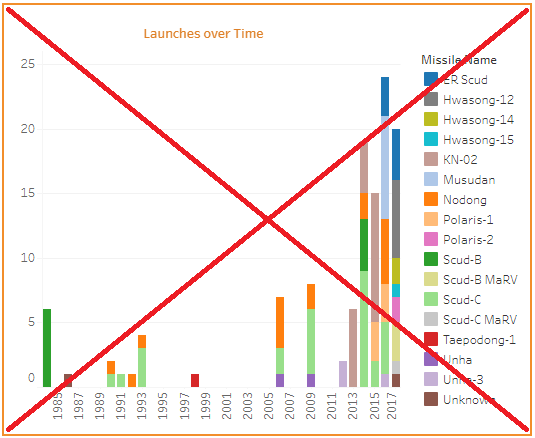 My mouse-over text not only shows the total number of launches, but also lists each individual launch. I use Proc Gremove to get rid of internal boundaries within countries (I only show the country border), and I color the countries such that North Korea stands out and all the other countries are visually less attention-grabbing (gray). And I make the water blue, so it's more obvious that it's water. Below is a screen-capture of my map - click it to see the interactive version with HTML mouse-over text. Now that you've got a handle on all those North Korean missiles, what do you think the future holds? The last 4 years have had a large number of launches - will we see more launches, or fewer launches, in 2018? Shared on LinkedIn, Robert. Succinct and informative. NIce charts! For those interested, SAS Communities member @ChrisBrooks created a version of this map with PROC SGMAP, which is part of Base SAS and included in SAS University Edition. It's not as fancy as what you've shared, but his version required less code and can be rendered even if you don't have SAS/Graph. Love this! I would like to add in potential arcs for each launch - i.e. flattening them out to show potential risk areas.